The Tall Man Movie Fear takes a new shape. 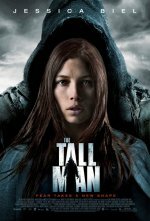 The Tall Man release date was Friday, August 31, 2012. This was a Limited in theaters release. Julia (Jessica Biel) is a nurse living in Cold Rock who doesn't believe in legends. Until one night, waking up with an eerie feeling, she goes to her son's bedroom and finds his bed empty. Rushing downstairs, she stops dead in her tracks: A huge dark figure stands in the entrance holding her son, David. Driven by pure instinct, Julia rushes after them, willing to do whatever it takes to get her son back. The chase is on and with it the quest for answers.